Please call us at (808) 430 5660 or (808) 430 5563 if you loose your ring, necklace, GoPro, mobile phone, camera or valued item - and we’ll do our very best to help you find it! Call us as soon as you can! As much as you may want to, it’s best not to dig through the sand (it can dislodge, sink or even move your item making it more difficult to find). Be aware that people may have seen that you’ve lost something valuable and they may return when you leave, so time is of the essence! Be sure you only reveal the location of your valued item to a trusted source - the sooner you call us, the better our chance to successfully recover your lost treasure! Within the Kailua – Kona area, along the west coast of the Big Island, Hawaii (from Captain Cook to Hapuna Beach), we charge a $150 service-fee to go to the recovery location. This service-fee covers our gas, time and transportation. For jobs accepted outside the West Coast (Waimea in the north - and past Captain Cook in the south), due to distances on the Big Island, we’ll charge a $185 service-fee. We’ll charge an additional $50 if SCUBA diving & equipment is necessary for any recovery. All Recoveries are on a REWARD System - so we DO ask for a reward based on what the lost item is worth to you and what you can afford. Outside of our service-fee, this reward is up-to-you - and only requested if we FIND your lost item. Sometimes, your lost treasure can be found in seconds - other times in hours or days! Again, we ask that the reward be based not on the time it takes, but on the fact that we’ve recovered your lost treasure! We accept all Credit Cards no matter how remote the location. We will ask you to sign an MOU (Memorandum of Understanding) before we begin our search to assure you that if your precious item is found, we WILL return it! Our reputation is everything on this Island so we want to be sure you are confident that you are dealing with the most competent and honest people in the business! Beach, Underwater & Private property with permission. We learned metal detecting and ring recovery on the beaches of Phuket, Thailand and are now based on the Big Island of Hawaii, USA. Metal detecting is a hobby AND a business, so we spend a lot of time studying conditions, tides - and put a lot of energy into looking for lost items. We own our own recovery equipment, diving gear and work with a well-known snuba company while helps on our searches. We have successfully recovered rings for clients both on the beach and in the ocean. We use Scuba for hunting below 15 feet and Snuba for recoveries in shallow water when possible. We use the famed Minelab Excalibur II detector for our beach and underwater hunting. IF you’ve lost your precious ring or valuable bracelet/earrings, please don’t hesitate to call. My wife and I were on our honeymoon on the Big Island in early 2017. We were having an amazing time until we stopped at a beach in Hilo. After a few minutes of swimming near turtles I realized I had lost my wedding ring. I was in a state of shock. The gold ring was a family heirloom. My mother had given my father the ring when they married over 40 years ago. 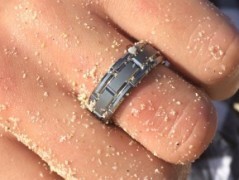 I couldn’t believe it was now lost in the ocean just three months after my wedding. For over an hour I attempted to find it but I eventually gave up. I had lost hope. But that’s when I found out my wife had a plan. When I got out of the water she was already on the phone with Brent at Big Island Metal Detecting. I was sure the ring was lost for good, but Brent convinced us he could help find it. Since it was so late in the day we agreed to meet at the beach early the next morning. Brent drove across the island from Kona to meet us at 6:30 a.m.
By 7 a.m. the ring was back on my finger! 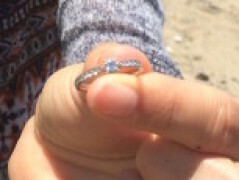 Brent was able to locate the ring even though it was buried in sand in water over six feet deep. Brent turned the lowest moment of our honeymoon into a story we will never forget. We then all celebrated with an early breakfast in town. We had found the ring and made a new friend. Thank you so much Brent. "Yesterday morning Sergey and I were taking pictures and he lost his ring, it just fell right off an we panicked. Looking for it all day we lost hope. Called ‪#‎bigislandmetaldetcting‬, 5 hours later with these guys we got our ring back! Sergey dug it up in the place we thought it would be. It was dislodged under a rock about a foot and a half in the sand! We are so blessed - these peaople were so kind and just the greatest! Thank you such Brent and Sylvie!!" I still can't believe I lost the ring exactly a year after I received it, at the exact spot! We spent our romantic evening digging through sand (and crying) thinking the ring was swept by the wave.The next morning we came back to look some more hoping it will magically reappear, but yet again no luck. In times of despair, we considered buying our own metal detector, but we are soooo glad we decided to call Brent and Sylvie instead. Who knew there are people who specialize in finding lost rings! Brent and Sylvie are very sweet, fair and genuine. Brent went fast to work without even asking for the money upfront. I was warned not to get my hopes up if he finds something fast because most of the time it will be junk. Brent took the first scoop of sand out and I turned away because I did not want to see what "junk" object he found. I did not hear anything so I turned back and looked at Brent; he smiled and gestured for me to come look into the silver bucket. It was my ring! I spent the night thinking I will never find my ring, so it was a very joyful moment for all of us. Brent and Sylvie were very happy for us which made it even more special! Thank you Brent and Sylvie, 5 stars for you!